Original design and stitching by Dexie Smith. Graphics and Directions by Sunshine. 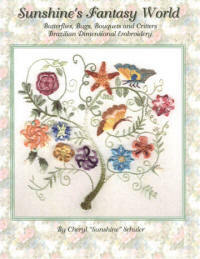 Intermediate Brazilian Embroidery Design. 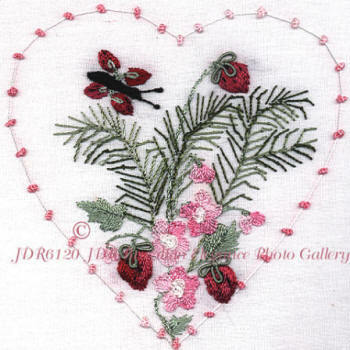 A tasty design that would be great as a small picture, a small pillow or as a quilt block. All of the directions are included. This is not a difficult design to stitch. If you don't know how to do double cast-on stitches - a satin stitched area will do just as nicely! What I think would be a great addition to this design is a small lady bug sitting in the ferns. Start looking for a charm that would be great there. A stitch review is provided.